📍 Bank of America Stadium – Charlotte, N.C.
🏈⏰ Kickoff Time || Saturday, Dec. 1 || 8 p.m. 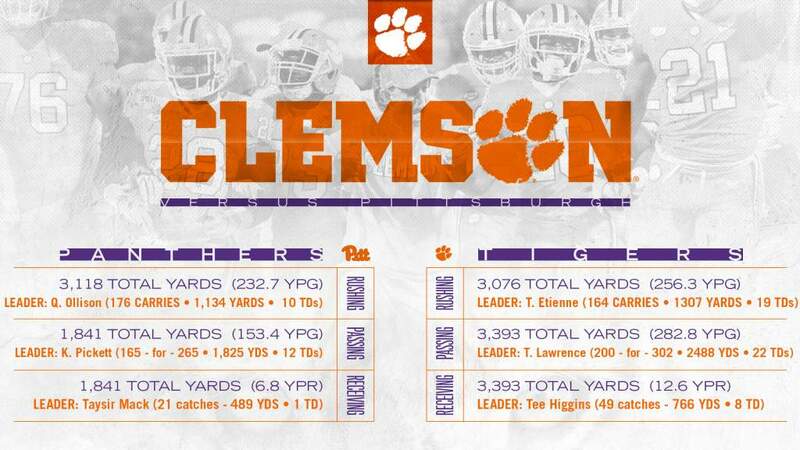 The Atlantic Division champion Clemson Tigers will be in search of another piece of history when the team takes to the field against the Coastal Division champion Pittsburgh Panthers in the 2018 ACC Championship Game. Kickoff from Bank of America Stadium in Charlotte is scheduled for 8 p.m. ET. 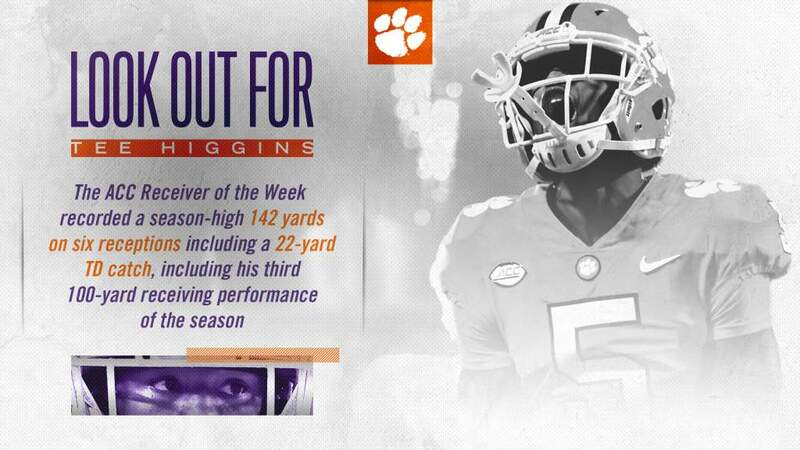 A win on Saturday would give Clemson its fourth consecutive ACC title and make the Tigers the first team in the conference’s 66-season history to win four consecutive outright titles. Bobby Bowden’s Florida State squads earned at least a share of the ACC title in nine straight seasons across the 1992-2000 campaigns but never earned four outright titles in a row. Clemson would be the first Power Five team to win four consecutive conference title games since Florida rattled off four straight SEC Championship Game wins from 1993-96. The Clemson senior class enters the contest with an ACC-record 52 career wins. Featured among that group is defensive tackle Christian Wilkins, who is expected to play in his 57th career game on Saturday, which would tie fullback Chad Diehl (57 from 2007-11) for the most career games played in school history. Pittsburgh is the last ACC team to defeat Clemson, having beaten the Tigers, 43-42, in 2016. With a win over Pittsburgh, Clemson would end a two-game losing streak to Pitt and have an active winning streak of at least one game against all 13 other ACC institutions. The game will be played on the 10th anniversary of Dabo Swinney being named as Clemson’s full-time head coach on Dec. 1, 2008. Clemson is 113-30 under Swinney, including a 109-27 mark in his 10 full seasons. They don't put championship rings on smooth hands! IPTAY and the Athletic Department received more requests than tickets available for the 2018 ACC Championship Game in Charlotte, N.C. on Dec. 1. Point cut-offs for IPTAY members will be communicated over the next few days. Fans wishing to purchase official tickets may do so through Ticketmaster by clicking here. Or, visit theACC.com for more information. Official Bowl Travel Packages are available here. Friday, Nov. 30th, 7 p.m.
Join the Clemson Alumni Association and IPTAY as we kick-off the weekend! Free to attend. Saturday, Dec. 1, 4 p.m.
Join the Charlotte Clemson Club, Clemson Alumni Association and IPTAY prior to the big game! Saturday, Dec. 1, 2:30-6:30 p.m. The ultimate pregame tailgate spot at Romare Bearden Park located one block from the stadium is free to the public! ACC Tailgate Central is the official gathering place for all ACC fans before the big game. ACC Tailgate Central pregame hospitality gets you four hours of pregame entertainment (2:30p – 6:30p) including appearances by ACC team bands and cheerleaders, TVs for game-watching, ACC Football Championship Trophy photo opportunities, pre-game chalk talk with ACC Radio hosts, tailgate games and more! Food and beverages will be available for purchase. Gear Up for the Holidays Here!